Feedback : Position, Velocity, Current, Realtime tick, Trajectory, Temperature, Input Voltage, etc. The max torque measurement method for the Stall Torque and Performance Graph is different. Stall torque is measured from the max torque that it can reach. This is generally how RC servos measure their torque. For the Performance graph with the N-T curves, it is measured with the load gradually increasing. 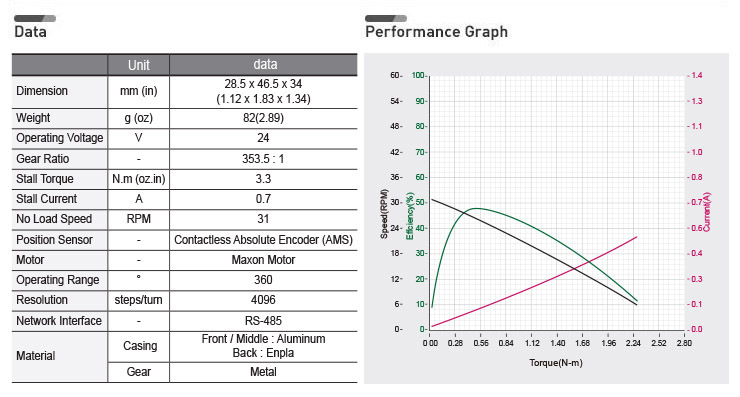 The motor operation environment is closer to the performance graph, not stall torque method. This is probably why the performance graph is being broadly used in the industrial market. This is why the max torque of the performance grap can actually be less than the stall torque. Precautions when connecting to power supply! - For the stable power supply, we recommend using ROBOTIS controller or SMPS2Dynamixel. - Connect your DYNAMIXEL to power supply while it’s off and turn on/off with the power switch. The Control Table is a structure of data implemented in the Dynamixel. Users can read a specific Data to get status of the Dynamixel with Read Instruction Packets, and modify Data as well to control Dynamixels with WRITE Instruction Packets. The Control Table is a structure that consists of multiple Data fields to store status of the Dynamixel or to control the Dynamixel. Users can check current status of the Dynamixel by reading a specific Data from the Control Table with Read Instruction Packets. WRITE Instruction Packets enable users to control the Dynamixel by changing specific Data in the Control Table. The Address is a unique value when accessing a specific Data in the Control Table with Instruction Packets. In order to read or write data, users must designate a specific Address in the Instruction Packet. Please refer to the Protocol section of e-Manual for more details about Packets. Note : Two's complement rule is followed to find the negative value. For more information, please refer to the following link (Two's complement link). The Control Table is divided into 2 Areas. Data in the RAM Area is reset to initial values when the Dynamixel is turned on (Volatile). On the other hand, modified data in the EEPROM Area keeps their values even when the Dynamixel is turned off (Non-Volatile). Data in the EEPROM Area can only be changed when the value of Torque Enable(64) is cleared to ‘0’. The Control Table has two different access properties. ‘RW’ property stands for read and write access permission while ‘R’ stands for read only access permission. Data with the read only property cannot be changed by the WRITE Instruction. Read only property(‘R’) is generally used for measuring and monitoring purpose, and read write property(‘RW’) is used for controlling Dynamixels. Each data in the Control Table is restored to initial values when the Dynamixel is turned on. Default values in the EEPROM area are initial values of the Dynamixel (factory default settings). If any values in the EEPROM area are modified by a user, modified values will be restored as initial values when the Dynamixels is turned on. Initial Values in the RAM area are restored when the Dynamixels is turned on. The Size of data varies from 1 to 4 bytes depend on their usage. Please check the size of data when updating the data with an Instruction Packet. Note : Protocol 1.0 does not support addresses greater than 256. Therefore, Indirect Address 29 ~ 56 and Indirect Data 29 ~ 56 can only be accessed with Protocol 2.0. Note : Any Data in EEPROM Area can only be modified when the value of Torque Enable(64) is cleared to ‘0’. This address stores model number of the Dynamixel. This address stores firmware version of the Dynamixel. The ID is a unique value in the network to identify each Dynamixel with an Instruction Packet. 0~252 (0xFC) values can be used as an ID, and 254(0xFE) is occupied as a broadcast ID. The Broadcast ID(254, 0xFE) can send an Instruction Packet to all connected Dynamixels simultaneously. Note : Please avoid using an identical ID for multiple Dynamixels. In order to change the ID in the EEPROM Area, Torque Enable(64) has to be cleared to ‘0’ in advance. Baud Rate determines serial communication speed between a controller and Dynamixels. Note : Less than 3% of the baud rate error margin will not affect to UART communication. After the Dynamixel receives an Instruction Packet, it delays transmitting the Status Packet for Return Delay Time (9). For instance, if the Return Delay Time(9) is set to ‘10’, the Status Packet will be returned after 20[μsec] when the Instruction Packet is received. Dynamixel only controls current(torque) regardless of speed and position. This mode is ideal for a gripper or a system that only uses current(torque) control or a system that has additional velocity/position controllers. This mode is identical to the Wheel Mode(endless) from existing Dynamixels. This mode is ideal for wheel-type robots. This mode is identical to the Joint Mode from existing Dynamixels. Operating position range is limited by Max Position Limit(48) and Min Position Limit(52). This mode is ideal for articulated robots that each joint rotates less than 360 degrees. This mode is identical to the Multi-Turn Mode from existing Dynamixels. 512 turns are supported(-256[rev] ~ 256[rev]). This mode is ideal for multi-turn wrists or conveyer systems or a system that requires an additional reduction gear. This mode controls both position and current(torque). Up to 512 turns are supported(-256[rev] ~ 256[rev]). This mode is ideal for a system that requires both position and current control such as articulated robots or grippers. This mode directly controls PWM output. Note 1 : Switching Operating Mode will reset gains(PID, Feedfoward) properly to the selected Operating Mode. The profile generator and limits will also be reset. Changed Position Gain(PID) and PWM Limit(36) values can be read from the Control Table. Note 2 : PWM is the abbreviation for Pulse Width Modulation that modulates PWM Duty to control motors. The PWM Control Mode changes pulse width to control average supply voltage to the motor and this technique is widely used in the motor control field. Therefore, PWM Control Mode uses Goal PWM(100) value to control supply voltage for Dynamixel. PWM Control Mode is similar to the Wheel Mode of Dynamixel AX and RX series. Set the Dynamixel’s Secondary ID. Secondary ID(12) is a value to identify each Dynamixel, just like ID(7). ① Secondary ID(12) is not a unique value. i.e., a lot of Dynamixels may have the same Secondary ID value. ② ID(7) has a higher priority than Secondary ID(12). i.e., if Secondary ID(12) and ID(7) are the same, ID(7) will be applied first. ③ The EEPROM area of the Control Table cannot be modified with Secondary ID(12). Only the RAM area can be modified. ④ If Instruction Packet ID is the same as Secondary ID(12), the Status Packet will not be returned. ⑤ If the value of Secondary ID(12) is 253 or higher, the Secondary ID function is deactivated. The following are examples of operation when there are five Dynamixels with ID (7) set from 1 to 5. ① Set all five Dynamixels' Secondary ID(12) to '5'. ② Send Write Instruction Packet(ID = 1, LED(65) = 1). ③ Turn on LED of Dynamixel with ID '1' and return the Status Packet. ④ Send Write Instruction Packet(ID = 5, LED(65) = 1). ⑤ Turn on LED on five Dynamixels. However, Status Packet of Dynamixel with ID ‘5’ will be returned. ⑥ Set the Secondary ID(12) of all five Dynamixels to ‘100’. ⑦ Send Write Instruction Packet(ID = 100, LED(65) = 0). ⑧ Turn off LED on five Dynamixels. However, as there is no Dynamixel with ID ‘100’, Status Packet is not returned. Users can select Dynamixel protocol version (1.0 and 2.0). It is recommended to use an identical protocol version for multiple Dynamixels. Note : The protocol 2.0 is greatly improved from the protocol 1.0. Accessing some of the Control Table area might be denied if protocol 1.0 is selected. This manual complies with protocol 2.0. Please refer to the Protocol section of e-Manual for more details about the protocol. Users can adjust the Home position by setting Home Offset(20). The Homing Offset value is added to the Present Position(132). Present Position(132) = Actual Position + Homing Offset(20). Note : In case of the Position Control Mode(Joint Mode) that rotates less than 360 degrees, any invalid Homing Offset(20) values will be ignored(valid range : -1024 ~ 1024). This value helps to determine whether the Dynamixel is in motion or not. When the absolute value of Present Velocity(128) is greater than the Moving Threshold(24), Moving(122) is set to ‘1’, otherwise it is cleared to ‘0’. This value limits operating temperature. When the Present Temperature(146) that indicates internal temperature of Dynamixel is greater than the Temperature Limit(31), the Over Heating Error Bit(0x04) and Hardware Error Bit(0x80) in the Hardware Error Status(70) will be set. If Overheating Error Bit(0x04) is configured in the Shutdown(63), Torque Enable(64) is cleared to ‘0’ and Torque is disabled. For more details, please refer to the Shutdown(63) section. These values are maximum and minimum operating voltages. When current input voltage acquired from Present Input Voltage(144) exceeds the range of Max Voltage Limit(32) and Min Voltage Limit(34), Voltage Range Error Bit(0x01) and Hardware Error Bit(0x80) in the Hardware Error Status(70) are set. If Input Voltage Error Bit(0x10) is configured in the Shutdown(63), Torque Enable(64) is cleared to ‘0’ and Torque is disabled. For more details, please refer to the Shutdown(63) section. This value indicates maximum PWM output. Goal PWM(100) can’t be configured with any values exceeding PWM Limit(36). PWM Limit(36) is commonly used in all operating mode as an output limit, therefore decreasing PWM output will result in decreasing torque and velocity. For more details, please refer to the Gain section of each operating modes. This value indicates maximum current(torque) output limit. Goal Current(102) can’t be configured with any values exceeding Current Limit(38). The Current Limit(38) is used in Torque Control Mode and Current-based Position Control Mode, therefore decreasing Current Limit(38) will result in decreasing torque of Dynamixel. For more details, please refer to the Position PID Gain(80 ~ 84). Note : Current Limit(38) could be differ by each Dynamixel so please check the Control Table. This value indicates maximum Profile Acceleration(108). Profile Acceleration(108) can’t be configured with any values exceeding Acceleration Limit(40). Profile Acceleration(108) is used in all operating mode except Torque Control Mode in order to generate a target trajectory. For more details, please refer to the Profile Velocity(112). Note : Bit information of the Error field in the Status Packet is different from protocol 1.0 and protocol 2.0. This manual complies with protocol 2.0. Please refer to the Protocol section of e-Manual for more details about the protocol. This value indicates maximum velocity of Goal Velocity(104) and Profile Velocity(112). For more details, please refer to the Profile Velocity(112). These values limit maximum and minimum target positions for Position Control Mode(Joint Mode) within the range of 1 rotation(0~4095). 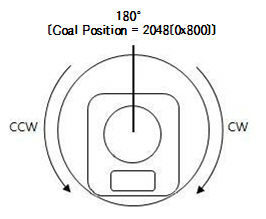 Therefore, Goal Position(116) should be configured within the position limit range. These values are not used in Extended Position Control Mode and Current-based Position Control Mode. Note : Max Position Limit(48) and Min Position Limit(52) are only used in Position Control Mode with a single turn. The Dynamixel can protect itself by detecting dangerous situations that could occur during the operation. Each Bit is inclusively processed with the ‘OR’ logic, therefore, multiple options can be generated. For instance, when ‘0x05’ (binary : 00000101) is defined as Shutdown(63), Dynamixel can detect both Input Voltage Error(binary : 00000001) and Overheating Error(binary : 00000100). If those errors are detected, Torque Enable(64) is cleared to ‘0’ and the motor output becomes 0[%]. REBOOT is the only method to reset Torque Enable(64) to ‘1’(Torque ON) after the shutdown. The followings are detectable situations. Note : If Shutdown occurs, use below method to REBOOT Dynamixels. Controls Torque ON/OFF. Writing ‘1’ to this address will turn on the Torque and all Data in the EEPROM area will be protected. Torque OFF(Free-run) and the motor does not generate torque. Torque ON and all Data in the EEPROM area will be locked. Note : Present Position(132) can be reset when Operating Mode(11) and Torque Enable(64) are updated. For more details, please refer to the Homing Offset(20) and Present Position(132). Turn on or turn off the LED. Dynamixel LED can only be controlled by LED(65). This value decides how to return Status Packet when Dynamixel receives an Instruction Packet. Status Packet will only be returned for READ Instruction. exceptionally returns Status Packet to all Instruction. Status Packet will be returned for all Instructions. Note : If the ID of Instruction Packet is set to Broad Cast ID(0xFE), Status Packet will not be returned for READ and WRITE Instructions regardless of Status Return Level(68). For more details, please refer to the Protocol section of e-Manual. This value will be set to ‘1’ when Dynamixel receives REG_WRITE Instruction Packet and processing ACTION Instruction Packet will clear the value to ‘0’. This value indicates hardware error status. For more details, please refer to the Shutdown(63). These values indicate Gains of Velocity Control Mode. Gains of Dynamixel’s internal controller can be calculated from Gains of the Control Table as shown below. The constant in each equations include sampling time. Velocity P Gain of Dynamixel’s internal controller is abbreviated to KVP and that of the Control Table is abbreviated to KVP(TBL). Below figure is a block diagram describing the velocity controller in Velocity Control Mode. When the instruction transmitted from the user is received by Dynamixel, it takes following steps until driving the horn. ① An Instruction from the user is transmitted via Dynamixel bus, then registered to Goal Velocity(104). ② Goal Velocity(104) is converted to target velocity trajectory by Profile Acceleration(108). ③ The target velocity trajectory is stored at Velocity Trajectory(136). ④ PI controller calculates PWM output for the motor based on the target velocity trajectory. ⑤ Goal PWM(100) sets a limit on the calculated PWM output and decides the final PWM value. ⑥ The final PWM value is applied to the motor through an Inverter, and the horn of Dynamixel is driven. ⑦ Results are stored at Present Position(132), Present Velocity(128), Present PWM(124) and Present Current(126). Note : Ka stands for Anti-windup Gain and ‘β’ is a conversion coefficient of position and velocity that cannot be modified by users. For more details about the PID controller, please refer to the below website. These Gains are used in Position Control Mode and Extended Position Control Mode. Gains of Dynamixel’s internal controller can be calculated from Gains of the Control Table as shown below. The constant in each equations include sampling time. Position P Gain of Dynamixel’s internal controller is abbreviated to KPP and that of the Control Table is abbreviated to KPP(TBL). Below figure is a block diagram describing the position controller in Position Control Mode and Extended Position Control Mode. When the instruction from the user is received by Dynamixel, it takes following steps until driving the horn. ① An Instruction from the user is transmitted via Dynamixel bus, then registered to Goal Position(116). ② Goal Position(116) is converted to target position trajectory and target velocity trajectory by Profile Velocity(112) and Profile Acceleration(108). ③ The target position trajectory and target velocity trajectory is stored at Position Trajectory(140) and Velocity Trajectory(136) respectively. ④ Feedforward and PID controller calculate PWM output for the motor based on target trajectories. Note1) : In case of PWM Control Mode, both PID controller and Feedforward controller are deactivated while Goal PWM(100) value is directly controlling the motor through an Inverter. In this manner, users can directly control the supplying voltage to the motor. Note2) : Ka is an Anti-windup Gain that cannot be modified by users. Below figure is a block diagram describing the current-based position controller in Current-based Position Control Mode. As Current-based Position Control Mode is quite similar to Position Control Mode, differences will be focused in the following steps. The differences are highlighted with a green marker in the block diagram as well. ① Feedforward and PID controller calculates target current based on target trajectory. ② Goal Current(102) decides the final target current by setting a limit on the calculated target current. ③ Current controller calculates PWM output for the motor based on the final target current. ④ Goal PWM(100) sets a limit on the calculated PWM output and decides the final PWM value. 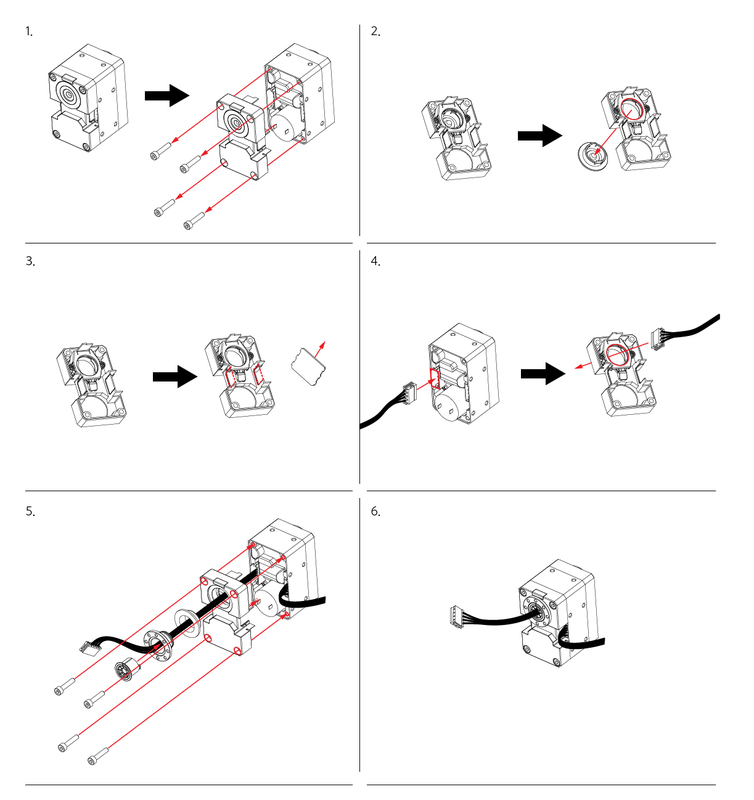 ⑤ The final PWM value is applied to the motor through an Inverter, and the horn of Dynamixel is driven. ⑥ Results are stored at Present Position(132), Present Velocity(128), Present PWM(124) and Present Current(126). Note : Ka is an Anti-windup Gain that cannot be modified by users. For more details about the PID controller and Feedforward controller, please refer to the below websites. Bus Watchdog (98) is a safety device (Fail-safe) that stops the Dynamixel if the communication between the controller and Dynamixel communication (RS485, TTL) is disconnected due to an unspecified error. Communication is defined as all the Instruction Packet in the Dynamixel Protocol. The Bus Watchdog function monitors the communication interval (time) between the controller and Dynamixel when Torque Enable (64) is '1'. If the measured communication interval (time) is larger than Bus Watchdog (98), the Dynamixel will stop. Bus Watchdog (98) will be changed to '-1' (Bus Watchdog Error). If the Bus Watchdog Error screen appears, the Goal Value (Goal PWM(100), Goal Current(102), Goal Velocity(104), Goal Position(116)) will be changed to read-only-access. Therefore, when a new value is written to the Goal Value, a Range Error will be returned via the Status packet. If the value of Bus Watchdog (98) is changed to '0', Bus Watchdog Error will be cleared. Note: For details of Range Error, please refer to the protocol of the e-Manual. The following are examples of the operation of the Bus Watchdog function. ① After setting the operating mode (11) to speed control mode, change the Torque Enable (64) to '1'. ② If '50' is written in the Goal Velocity (104), the Dynamixel will rotate in CCW direction. ④ If no instruction packet is received for 2,000 [ms], the Dynamixel will stop. When it stops, the Profile Acceleration (108) and Profile Velocity (112) are applied as '0'. ⑤ The value of Bus Watchdog (98) changes to '-1' (Bus Watchdog Error). At this time, the access to the Goal Value will be changed to read-only. ⑥ If '150' is written to the Goal Velocity (104), Range Error will be returned via Status Packet. ⑦ If the value of Bus Watchdog (98) is changed to '0', Bus Watchdog Error will be cleared. ⑧ If “150” is written in the Goal Velocity (104), the Dynamixel will rotate in CCW direction. In case of PWM Control Mode, both PID controller and Feedforward controller are deactivated while Goal PWM(100) value is directly controlling the motor through an Inverter. In other control modes, this value is used to limit PWM value. This value cannot exceed PWM Limit(36). Please refer to the Gain section in order to see how Goal PWM(100) affects to different control modes. In case of Torque Control Mode, Goal Current(102) can be used to set a target current. This value sets a limit to current in Current-based Position Control mode. This value cannot exceed Current Limit(38). Note : Applying high current to the motor for long period of time might damage the motor. In case of Velocity Control Mode, Goal Velocity(104) can be used to set a target velocity. This value cannot exceed Velocity Limit(44). For now, Goal Velocity(104) is used for target velocity, but this value is not used to limit the velocity. Note1) : The maximum velocity and maximum torque of Dynamixel is affected by supplying voltage. Therefore, if supplying voltage changes, so does the maximum velocity. This manual complies with recommended supply voltage. Note2) : If Profile Acceleration(108) and Goal Velocity(104) are modified simultaneously, modified Profile Acceleration(108) will be used to process Goal Velocity(104). The acceleration of Profile can be set with this value. Profile Acceleration(108) can be used in all control modes except Torque Control Mode. Profile Acceleration(108) cannot exceed Acceleration Limit(40). For more details, please refer to the Profile Velocity(112). The value '0' on Profile Acceleration(108) means infinite acceration. The Maximum velocity of Profile can be set with this value. Profile Velocity(112) can be used in all control modes except Torque Control Mode and Velocity Control Mode. Profile Velocity(112) cannot exceed Velocity Limit(44). Velocity Control Mode only uses Profile Acceleration(108) instead of Profile Velocity(112). If Profile Velocity(112) is set to ‘0’, it stands for infinite velocity. The Profile is an acceleration/deceleration control method to reduce vibration, noise and load of the motor by controlling dramatically changing velocity and acceleration. 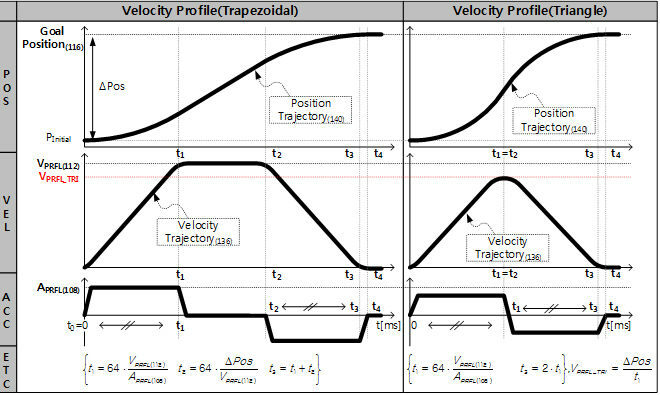 It is also called Velocity Profile as it controls acceleration and deceleration based on velocity. Dynamixel provides 4 different types of Profile. The following explains 4 Profiles and how to select them. Profiles are usually selected by a combination of Profile Velocity(112) and Profile Acceleration(108). Triangular and Trapezoidal Profiles exceptionally consider total travel distance(ΔPos, the distance difference between target position and current position) as an additional factor. For convenience, Profile Velocity(112) is abbreviated to VPRFL and Profile Acceleration(108) is abbreviated to VPRFL. 'X' stands for "Don't Care" case. When given Goal Position(116), Dynamixel's profile creates target velocity trajectory based on current velocity(initial velocity of the Profile). When Dynamixel receives updated target position from a new Goal Position(116) while it is moving toward the previous Goal Position(116), velocity smoothly varies for the new target velocity trajectory. Maintaining velocity continuity while updating target velocity trajectory is called Velocity Override. For a simple calculation, let's assume that the initial velocity of the Profile is '0'. 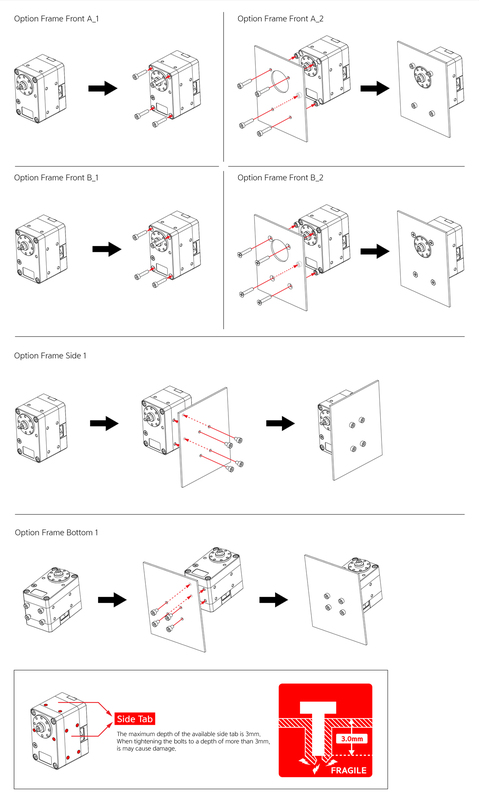 The following explains how Profile processes Goal Position(116) instruction in Position Control mode, Extended Position Control Mode, Current-based Position Control Mode. ② Acceleration time(t1) is calculated from Profile Velocity(112) and Profile Acceleration(108). ⑤ Dynamixel is driven by the calculated target trajectory from Profile. ⑥ Target velocity trajectory and target position trajectory from Profile are stored at Velocity Trajectory(136) and Position Trajectory(140) respectively. ⑦ VPRFL_TRI of ③ and Travel time(t3) to reach Goal Position(116) is calculated as below. Note1) : Dynamixel supports Jerk control in order to minimize dramatic change of acceleration. Therefore, actual travel time by the target trajectory of Profile could be longer than t3(t4 of above figure). Note2) : Velocity Control Mode only uses Profile Acceleration(108). Step and Trapezoidal Profiles are supported. Velocity Override and Jerk control are supported as well. Acceleration time(t1) can be calculated as below equation. Target position can be set with Goal Position(116). From the front view of Dynamixels, CCW is an increasing direction whereas CW is a decreasing direction. The way to reaching Goal Position(116) is differ by 4 Profiles provided by Dynamixels. Please refer to the Profile Velocity(112) for more details. Note : If Profile Acceleration(108), Profile Velocity(112) and Goal Position(116) are modified simultaneously, Goal Position(116) is processed based on updated Profile Acceleration(108) and Profile Velocity(112). This value indicates Dynamixel's time. This value indicates whether Dynamixel is in motion or not. If absolute value of Present Velocity(128) is greater than Moving Threshold(24), Moving(122) is set to '1'. Otherwise, it will be cleared to '0'. However, this value will always be set to '1' regardless of Present Velocity(128) while Profile is in progress with Goal Position(116) instruction. This value provides additional information about the movement. Following Error Bit(0x08) and In-Position Bit(0x01) only work with Position Control Mode, Extended Position Control Mode, Current-based Position Control Mode. This value indicates present PWM. For more details, please refer to the Goal PWM(100). This value indicates present Current. For more details, please refer to the Goal Current(102). This value indicates present Velocity. For more details, please refer to the Goal Velocity(104). Note : Present Position(132) represents 4[byte] continuous range(-2,147,483,648 ~ 2,147,483,647) when Torque is turned off regardless of Operating Mode(11). Case 1) Present Position(132) is reset with the value within 1[rev] (0 ~ 4,095) when Operating Mode(11) is changed to Position Control Mode. Case 2) Present Position(132) is reset with the value within 1[rev] (0 ~ 4,095) when Torque is turned on in Position Control Mode. Homing Offset(20) can affect to the Present Position(132) value. This is a target velocity trajectory created by Profile. Operating method can be changed based on control mode. For more details, please refer to the Profile Velocity(112). ① Velocity Control Mode : When Profile reaches to the endpoint, Velocity Trajectory(136) becomes equal to Goal Velocity(104). ② Position Control Mode, Extended Position Control Mode, Current-based Position Control Mode : Velocity Trajectory is used to create Position Trajectory(140). When Profile reaches to endpoint, Velocity Trajectory(136) is cleared to '0'. This is a target position trajectory created by Profile. This value is only used in Position Control Mode, Extended Position Control Mode, Current-based Position Control Mode. For more details, please refer to the Profile Velocity(112). This value indicates current voltage that is being supplied. For more details, please refer to the Max/Min Voltage Limit(32, 34). This value indicates internal temperature of Dynamixel. For more details, please refer to the Temperature Limit(31). Indirect Address and Indirect Data are useful when accessing two remote addresses in the Control Table as sequential addresses. Sequential addresses increase Instruction Packet efficiency. Addresses that can be defined as Indirect Address is limited to RAM area(Address 64 ~ 661). If specific address is allocated to Indirect Address, Indirect Address inherits features and properties of the Data from the specific Address. Property includes Size(Byte length), value range, and Access property(Read Only, Read/Write). For instance, allocating 65(Address of LED) to Indirect Address 1(168), Indirect Data 1(224) can perform exactly same as LED(65). B. Set Indirect Data 1(224) to ‘1’  LED(65) also becomes '1' and LED is turned on. C. Set Indirect Data 1(224) to ‘0’  LED(65) also becomes ‘0’ and LED is turned off. ② Example 2) Allocating Size 4[byte] Goal Position(116) to Indirect Data 2(225), all 4[byte] has to be allocated. A. Indirect Address 2(170) : change the value to '116' which is the first address of Goal Position. B. Indirect Address 3(172) : change the value to '117' which is the first address of Goal Position. C. Indirect Address 4(174) : change the value to '118' which is the first address of Goal Position. D. Indirect Address 5(176) : change the value to '119' which is the first address of Goal Position. E. Set 4[byte] value '1024' to Indirect Data 2  Goal Position(116) also becomes '1024 and Dynamixel moves. Note 1) : In order to allocate Data in the Control Table longer than 2[byte] to Indirect Address, all address must be allocated to Indirect Address like the above Example 2. Note 2) : Indirect Address 29 ~ 56 and Indirect Data 29 ~ 56 can only be accessed with Protocol 2.0.